showing off her water entry at just 5 months old! Bunch's brother sired our longtime premiere stud, Longplain Suntar. 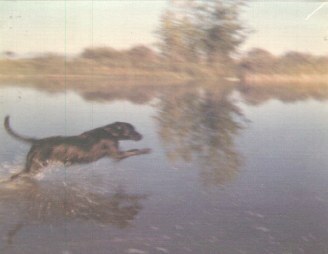 Our 1976 litter by Eli ex Plum (a wonderful marker and water dog) consisted of 5 black males, 2 black females. 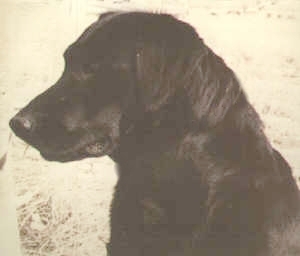 They were big, strong, solid pups, 100% sound (AFC Black Mike of Lakewood was a remarkable influence for excellent hips), and spectacular workers -- six were retrieving from ice water at 5½ weeks old! One had already brought in 40 ducks and 20 geese by 5½ months! 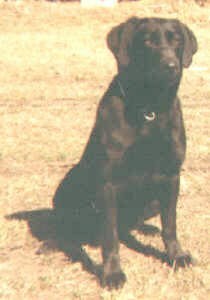 Josh was an excellent hunting dog, quiet in the house, good with kids, and very easy to live with. Like his sister Bunch, he had great intuition for whatever you wanted him to do. Sis. 2 FC, 4 pt'd.